In the year 1000, the economy of the Middle East was at least as advanced as that of Europe. But by 1800, the region had fallen dramatically behind — in living standards, technology, and economic institutions. In short, the Middle East had failed to modernize economically as the West surged ahead. What caused this long divergence? And why does the Middle East remain drastically underdeveloped compared to the West? In The Long Divergence, one of the world’s leading experts on Islamic economic institutions and the economy of the Middle East provides a new answer to these long-debated questions. “Timur Kuran,” by Tyler Cowen in the Marginal Revolution. “Historical Roots of Middle Eastern Uprisings.” by ” Kai Ryssdal’s radio interview on NPR’s Marketplace. 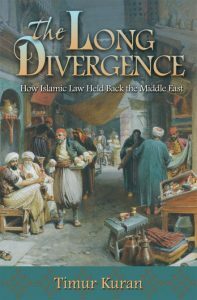 “Legal Roots of Economic Underdevelopment in the Middle East,” European Financial Review (Feb-Mar 2011): 10-11.
Review and long excerpt by Peter Passell in the Milken Institute Review, 13 (2011): 59-76.
Review with an emphasis on the role of the state by Metin Coşgel in the Journal of Economic History, 71 (December 2011): 1114-16. “Islamic Law, Institutions and Economic Development in the Islamic Middle East,”by Eric Chaney, a review essay in Development and Change, 42 (December 2011): 1465-72, calls for greater attention to the political constraints facing leaders in the Islamic Middle East, Europe, and Byzantium. “Is Islam Bad for Business,” by Jack Goldstone, a review essay in Perspectives on Politics, 10 (March 2012): 97-102.
Review by Mark Koyama, Public Choice, 153 (March 2013): 341-43.